Parish of Old St Pancras | Messy Church – Calling All Disciples! 12 Sep Messy Church – Calling All Disciples! The story of the calling of Peter, James and John is a familiar one. The guys were out fishing as they always did, and tonight, as is sometimes the case they’d come up with little. It must be frustrating and demoralizing to spend hours and hours working away and have nothing to show for it, particularly if you are self-employed. Without a product you can’t pay your bills. After a hard and disappointing night at work they probably just wanted to get everything tidied away, have something to eat and get some rest. But then coming towards them on the beach was a large crowd of people. The crowd stopped near them and one man came forward. He climbed into one of the boats, the boat belonging to Simon Peter. From the boat he began to teach. He didn’t look like anything special, but he spoke with a ferocity that was compelling, and the fisherman began to listen. Maybe they’d already heard about this man, maybe not… but there was something about him. Eventually he turned to the fishermen and asked them to push the boat out further and put their nets out again. Why? Their earlier efforts had been fruitless… but none the less they followed the instructions. And lo and behold their nets were full to breaking, so much so that they had to call to the other boat to come and help them. Such is the generosity of God, so great is his love for us, he didn’t have to fill those nets, he didn’t fill them with just enough, he filled them so full they were overflowing. Simon Peter, recognised the man as someone holy and special and he was afraid. Why had this man singled him out? He knew he was sinful and yet here he was, talking to him. The man said to him ‘do not be afraid, from now on you will be fishers of men’. When they returned to the shore they left the boats, the fish and the nets and followed him. 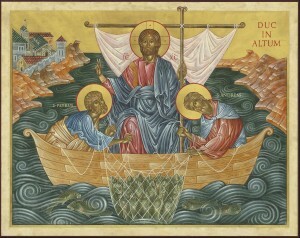 These three fishermen would become Jesus’ closest disciples. What was so special about these three? They were just ordinary people, imperfect people, Peter himself says “Lord stay away from me, I am a sinful man!!”. and in this particular story we see the nature of Christ, the everyday-ness of the people he calls to service, the abundance of God’s generosity and the expanse of possibility when Jesus is with us. You see, when peter first met Jesus, he was afraid he wasn’t good enough, maybe he thought he wasn’t clever enough or strong enough, or a good enough person, but Jesus had welcomed him, showed him patience, compassion and love. He had a purpose in following Christ. He’d realised that in following Christ, in being by his side, he was good enough. Then he was gone, and Peter felt abandoned, he went back to the only thing he knew, fishing. In another story, in John 21, we hear a very similar story, but this time Peter greets Jesus with joy. In seeing Christ again, he did not feel fear as he once had, instead he felt joy, the joy of being loved, the joy of having a purpose. Peter and John, recognise Jesus in the stranger on the beach. And they realise Jesus is still with them. In Paul’s letter to the Philippians he says “I can do all things through him who strengthens me.” Peter realizes he can do all things through Christ. When teaching the children this story, there are so many avenues of meaning to follow that it would be impossible to cover it all. So in this session we are going to look at how we are all called to follow Christ, even the most ordinary of us, because to Christ we are all extraordinary, and how in doing so we can witness the abundance of life that Christ offers us.